I cheated a little. 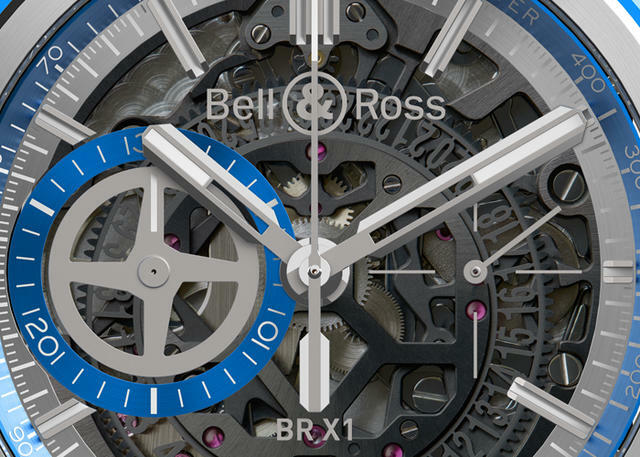 I was thrilled to request the new Bell & Ross BR-X1 HyperStellar for the purpose of this review, knowing full well that I would engage the assistance of my husband for the process. 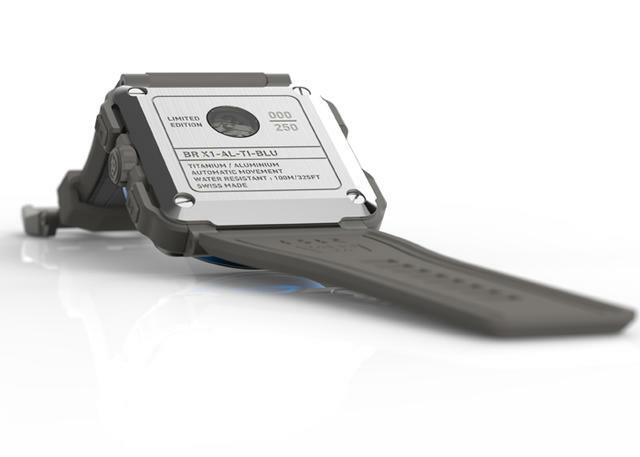 This watch, you see, is a bold watch, with a square 45mm case size and a masculine profile. And while I feel eminently able to comment on its look, its inner workings and its reason for being, I thought I needed a guy’s take on its comfort and overall appeal. My spouse, Curt, is not an expert on the subject of timepieces, but he does own quite a few nice watches and has strong opinions about the aesthetics of each and every one. 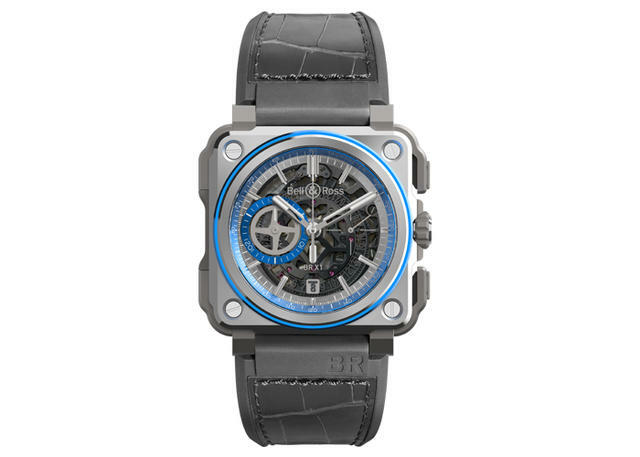 The BR-X1 HyperStellar was formally introduced at the Couture show in Las Vegas in June, and it got a lot of attention, as did the party that feted its debut. As you probably know, the BR-X1—part of the brand’s aviation collection—is a later generation of the BR-01, whose square shape is inspired by aeronautical flight instruments. This new chronograph takes it one step for mankind further, as it was designed as a timepiece for astronauts and is purportedly able to function quite well on missions that measure in light years rather than miles. The history of space exploration also reveals that mechanical chronographs have often enabled missions to be completed, and lives to be saved, in situations where electronic motor systems have malfunctioned. I find this intriguing, particularly since space tourism for citizens is hot on the horizon. The Hyperstellar’s space-specific characteristics include resistance to extreme temperatures, vibrations, pressure, corrosion and fortunately, as you will later see, impacts. 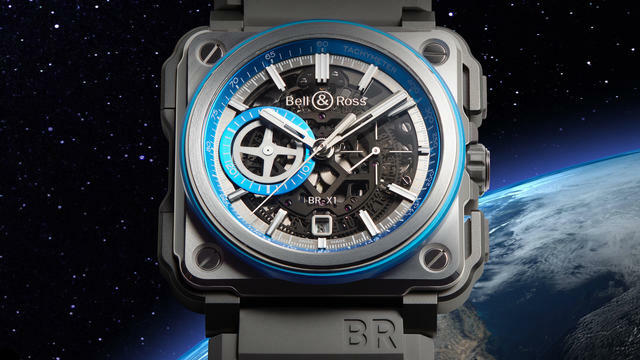 Its combo of metals, grade 5 titanium and anodized aluminum (blue), make it strong but light—just like a spaceship. The case cover, middle and center are polished titanium, while aluminum is used for the bezel insert. For extra strength and protection, a rubber “bumper” wraps around the signature square of the Bell & Ross “circle within a square” motif. The rocker-style chronograph pushers are easy to use, and remain so even while wearing gloves. The dial features simple and proportional indexes, and the open-worked hour and minute hands, as well as the aforementioned applied indexes, are luminescent for easy visibility. Beneath, the skeletonized automatic movement, the BR-CAL.313 with a black DLC-coated X-shaped upper bridge, is visible. Its chronograph function features a central seconds counter and a subdial at 9 o’clock to count 30 minutes of elapsed time marked by a turbine-inspired disk. A single date window is at 6 o’clock, while small seconds are on a subdial at 3 o’clock. The bright blue of the aluminum on the bezel insert is complemented by the blue tachymeter scale on the flange and the blue surrounding the 30-minute subdial, resulting in an overall pulled-together design. I like the rubber-lined gray alligator leather strap, which is expertly contoured and culminates in a buckle with a squared prong on one end and corresponding rectangular slots for size adjustment on the other. This combination of materials offers a great look and even greater durability, thanks to the moisture-repellent rubber on the strap’s interior. The predominantly solid caseback is interrupted only by a small window in the upper section providing a glimpse of the movement’s balance as it oscillates. The watch’s number within the limited edition of 250 pieces is engraved, as are a few other details about the timepiece, like its water resistance (100 meters) and the composition of the case. Then it was time for my husband’s off-the-cuff take. “Now that’s a good looking watch,” he immediately said when I handed it to him. Normally a fan of sleek, round and slimmer watches, I must admit I was a bit surprised. “I like the striking blue color against black,” he then said, adding that he also admired the unusual chrono pushers. “I like the look of the square case with the four screws and the weight of the watch—it has some heft to it, but not too much. I’d definitely wear it.” Then he dropped it, and what came next, though not quotable, was revealing. 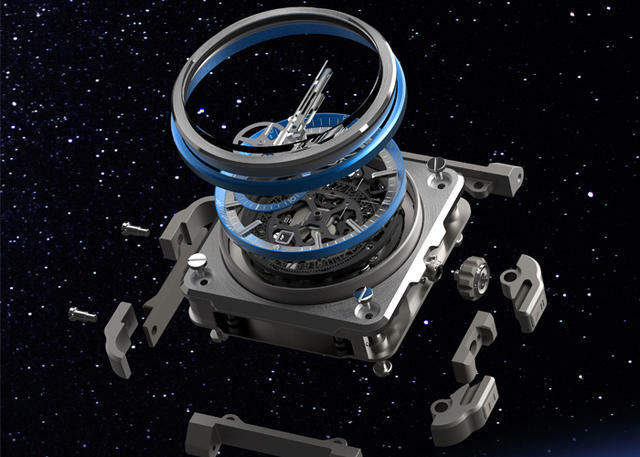 Suffice it to say that a watch destined for outer space can withstand a little jostling.